he Vacuum Filler was part of a brief name change between the illusive Golden Arrow (made July—November 1932) and the subsequent Vacumatic. Black, Grey and Red. The Junior version also came in a transparent plastic model referred to as the Crystal. It resembled the Demonstrator but was not marked as such but was part of the regular line. True Demonstrators are however known to exist. 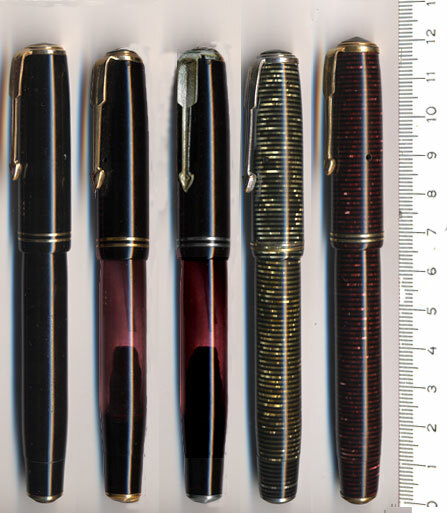 The Grey pens had nickel trim, other colours sported gold-filled trim, a feature that was to follow the subsequent Vacumatic through it's lifetime. There are also very rare examples of Crystal Vacuum Fillers with "opposite" nickel trim. he transparent red/black/blue laminated model was introduced in the late spring of 1933. It was probably only produced for a few weeks. The "stripes" on this pen are wider and it sported a black blind cap and section. Some items with the Vacumatic imprint have also been found. The Vacuum Fillers were produced from december 1932 to June 1933 and are considered rare. A black, grey and red Standard Vacuum Filler. The blind caps and double jewels are the colour of the pen. 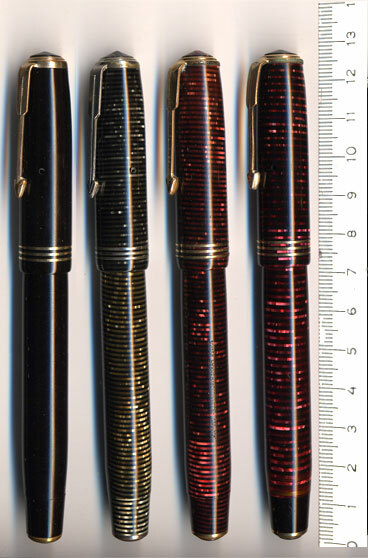 The fourth pen is the illusive red, black and blue, the first transparent Vacuum Filler, note the broader stripes. It is also distinguished by it's black section and blind cap. The first transparent Vacuum filler in red/black/blue (back lit). Junior sized Vacuum Fillers, a black opaque, a crystal, a crystal with rare opposite trim, a grey opaque and a red opaque. Usually all but the grey pens have trim in red gold. Note also the overall discrepancy in length. The opaque Sub-Junior vacuum fillers are shorter, but not slimmer, versions of the Juniors. They exist in either ring-tops or clips. 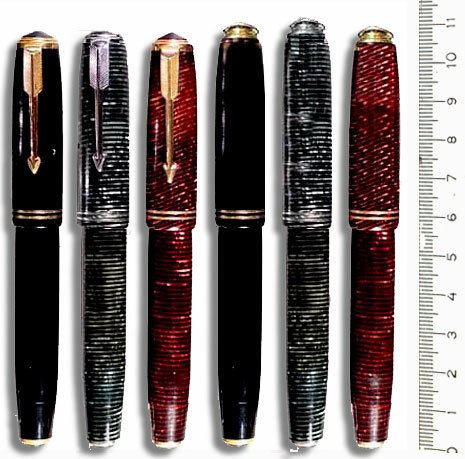 Transitional models also exist with the Vacumatic imprint. Early nibs. 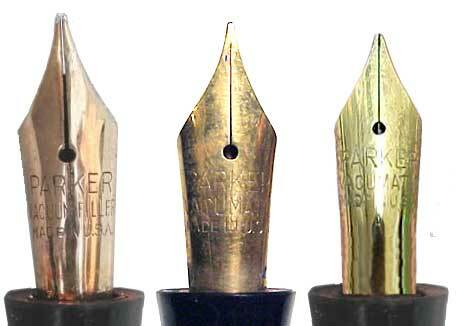 From the left: A 1932-1933 "Parker Vacuum Filler Made in USA" nib, a 1933 "Parker Vacumatic De Luxe" nib, a 1933-1934 "Parker Vacumatic Made in USA" without an arrow which was fitted to the bottom line. Only the Vacuum Filler nib was originally fitted to the Vacuum fillers, but the nib is the most commonly exchanged part of the pen and many pens have factory fitted replacement nibs. For more nibs found on later models take a look here.